Eating should be a fun and pleasurable experience but it can also be a source of frustration and confusion. It’s hard enough trying to figure out what to eat for you and your family, but when you add co-workers, students or health conditions (such as allergies), it can be even more challenging. March is Nutrition Month! This year the Alberta Health Services’ (AHS) theme is Find Answers at www.healthyeatingstartshere.ca. The “Healthy Eating at School” icon is specific to school environments, but all six icons have great information applicable school settings. The Canadian Foundation for Dietetic Research – 2015 Tracking Nutrition Trends survey found that almost half (49%) of Canadians get their food and nutrition information from the Internet, social media or blogs. 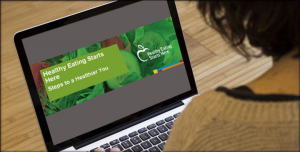 Our Moving and Choosing site: www.movingandchoosing.com, as well as the AHS site: www.healthyeatingstartshere.ca provide reliable, evidence-based information. How can you tell if other online nutrition information is reliable? If you see any of the following “red flags,” the information may not be accurate. Looking for more nutrition information for your classroom? Attend the Healthy Eating in the Classroom session being offered at the Southeastern Alberta Teacher’s Convention at the end of Feb. The session is led by dietitians who will walk you through how to use many of the resources and tools available at www.healthyeatingstartshere.ca. Register for the session or check out the nutrition page to find the answers you need.